Print Manager Plus provides a variety of restrictions to assist in providing a variety of tools for eliminating waste, securing resources and of course saving money. Below are three easy to implement, best practice restriction setting combinations that have been proven effective at reducing printer usage and costs right immediately upon installing Print Manager Plus. Providing a well-rounded print experience for the end user typically involves maintaining a variety of print and copy devices. These will range from small inkjet personal printers up through high output laser devices running as inexpensively as a couple pennies per page. The question becomes how to do we assist the end user in making environmentally conscience decisions each time they click the print button. The following restrictions can assist in preventing the user from sending large print jobs to low end, expensive devices. This is the simplest method of preventing a large print job from being sent to a low end device. This will help keep printing on expensive Inkjet printers limited to small everyday print jobs. Restricting the number of copies combined with preventing duplicate printing will prevent users from printing numerous copies of a document for the entire meeting, classroom, conference etc… when this printing belongs on high output printers. Have you ever gone to a printer and discovered you had accidentally printed the same document twice? Maybe an end user frequently double clicks the print button; or perhaps the anxious user who doesn’t see their document print right away, will attempt to print it again. The following restriction will prevent such extra prints being performed. This restriction is typically set anywhere from 30 seconds to 300 seconds (5 minutes). Setting this on color devices, will not allow a job that is not going to actually use the color capabilities of the device. In some situations you may want a user to still be able to print a job, even when one of the afore-mentioned restrictions has been hit. 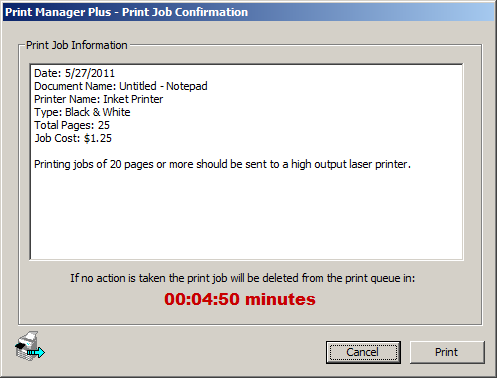 Print Manager Plus allows you the freedom of enabling the user to verify the job, rather than deleting it. These options are available by setting theRestriction Actions within the Settings Menu. The above was a small sampling of the power and versatility of the restrictions available in Print Manager Plus. We invite you to use the product for yourself, and share the restrictions that work to control printing in your environment.